I’ve been working on my thesis for the last few months, squirreled away in libraries and coffee shops, but now I’ve submitted and waiting to defend, I’m happy to share what’s happened in the meantime! A research paper I’ve been working on for a long time has been accepted, and published in the journal Structure. You can find it online, here. This paper makes up a bulk of the work in my PhD thesis, containing 10 protein crystal structures, and I’m glad to have it finally available to the world! In the paper I describe the structure of a protein that causes antibiotic resistance. This protein makes a bacterium resistant to a class of antibiotics called aminoglycosides. They are one of the oldest classes of antibiotics and include some well-known compounds such as streptomycin, kanamycin, tobramycin, and gentamicin. They are effective antibiotics used against a broad variety of bacteria, and resistance factors that make them ineffective are a serious problem in the treatment of infections. The protein that I work with generates aminoglycoside resistance. It chemically alters the antibiotics, turning them into inactive byproducts, making any bacterium with the protein resistant to aminoglycoside antibiotics. The protein acts as a “resistance factor” – bacteria that carry the gene for this protein use the protein to deactivate the antibiotic. They can easily break it down and go about their bacteria business instead of being killed. This protein is called APH(2”)-Ia (more on that name later). It inactivates several different aminoglycosides. To learn how it carries out this transformation, I looked at the structure of the molecule and how it changes when it interacts with the antibiotic. To understand why the structure is important, let’s talk about what this type of molecule really is. Proteins that carry out chemical reactions are also called enzymes. They allow a chemical change to happen that normally happens at extremely low or nonexistent rates. The enzymes that act on aminoglycoside antibiotics are collectively referred to as aminoglycoside-modifying enzymes. They deactivate antibiotics by transferring part of a common, metabolic molecule to the antibiotic. This makes the antibiotic worthless, and lets the bacterium survive the toxic effects of the compound. An enzyme drives a reaction by forcing these chemicals together. They do this by specifically binding to the molecules, in a mechanism sometimes referred to as a lock-and-key interaction. An enzyme is specific for the molecules that it acts on, like a lock only opens for a specific key. The keys of an aminoglycoside-modifying enzyme are the antibiotic and a cellular molecule that donates a chemical group to the antibiotic. In APH(2”)-Ia, that cellular molecule is guanosine triphosphate, or GTP. The enzyme binds the antibiotic and GTP tightly, and undergoes changes in structure to drive a chemical change between these molecules. This all happens in the most important part of the protein, the active site. The active site is the most important part of an enzyme. This part of the protein is typically a deep pocket that the rest of the molecule wraps around, where the enzyme holds and manipulates the molecules, and where chemical bonds are broken and formed. The enzyme separates these molecules from water and other compounds, and in this isolated state, the enzyme drives the chemical change to occur. The active site of any enzyme is typically extremely sensitive to the shape and properties of the molecules it acts upon. Evolution has driven enzymes to develop a high degree of specificity for these molecules, known as substrates. An enzyme typically has only a few different substrates that it acts upon. The combination of the specificity of chemicals that an enzyme acts on and the reaction it carries out gives it its name, in this case aminoglycoside phosphotransferase. I try to avoid saying the name of the protein I work on unless I want to sound important. APH(2”)-Ia stands for aminoglycoside (2”)-O-phosphototransferase type Ia. It’s usually preferable to just say “the enzyme” and that’s what I’ll mostly do here. As the “type Ia” might suggest, the enzyme is part of a larger group of enzymes that all carry out a similar reaction. They use magnesium atoms, held tightly in the active site, to move a phosphate group, PO43-, from one molecule to another. In this enzyme, it moves a phosphate from GTP to the aminoglycoside antibiotic. GTP is a nucleoside triphosphate molecule, the cellular phosphate source in this reaction. You might be familiar with a similar molecule, ATP, the “energy currency of the cell”. APH(2”)-Ia is somewhat unusual because most similar enzymes use ATP, but this enzyme uses GTP. Researchers in my lab and in other groups have studied the relationship between these proteins and GTP, and there’s still some interesting unsolved mysteries about the use of GTP in these proteins. However, for this work, I focused on the part of the molecule that is the same between ATP and GTP, the triphosphate. These enzymes that use nucleoside triphosphates as phosphate donor have a special name: kinases. We know quite a lot about kinases. Their importance for cell biology was discovered in the 1970s-1990s and researchers learned that they are critically important regulators of cellular metabolism, cell division, and many other processes. They add phosphate groups to proteins that generate molecular communication networks in the cell. In mammalian cells kinases are typically involved in important cellular decisions, and because many of these decisions impact how a cell grows and divides, many of these kinases are involved in cancer. When it was found that aminoglycoside phosphotransferases were kinase enzymes, there was already a large amount of research to compare to on similar enzymes. However, comparisons to other enzymes only gets you part of the way. To really learn how any molecule works, you have to look at it directly. How do you look at something a few nanometers in size? A mantra in the molecular sciences is that structure dictates function. I argue it needs a little updating, that structure and dynamics dictate function (more here and here), but you need to have a structure before you can study how it moves. Determining the structure is where we start. Using the techniques of structural biology, we can get a direct look at the molecules that carry out biological functions. Techniques like nuclear magnetic resonance, and electron microscopy can provide excellent structural information about biological macromolecules, but the technique I used for these experiments was X-ray crystallography. Matt Kimber, the professor who taught my undergraduate structural biology course referred to crystallography as a “one-trick pony, but it’s a damn good trick”. Well, I’ve ridden that pony right to the end of my degree. To determine a structure by crystallography, you purify the protein that you’re interested in, and run an array of experiments in parallel to try to find conditions under which it will form crystals. Not every protein can crystallize, and not every crystal gives you good data, which makes protein crystallography an intimidating technique. The perceived risk of protein crystallography experiments drives many in the molecular sciences to treat protein crystallographers with a sort of reverence. I don’t know that that reverence is particularly well-placed, but I’ll take it all the same. Crystals of APH(2”)-Ia + GMPPNP. This is a ~3μL drop with protein and various chemicals, suspended upside-down on a glass cover slide. The bright colours are because I used a polarizing filter, crystals do cool things when you shine polarized light through them! If you are able to make protein crystals of sufficient size and quality, then you can collect X-ray diffraction data with the crystals. Several companies sell instruments to collect this diffraction data, and there are dedicated facilities that conduct these experiments using high-intensity X-rays from accelerated electrons. The instrumentation for these experiments continues to dramatically improve, allowing us to get more and better data from our protein crystals all the time. The job of the X-ray crystallographer is much easier these days than it used to be. Using a home-based or synchrotron source, a beam of X-rays are directed at the protein crystal. X-rays interact with the electrons of a molecule. Because of the physics of diffraction of rays from a crystal, the result is a pattern of diffraction from the x-rays that can be recorded. By measuring these diffraction spots, we can apply physical rules about how diffraction works to interpret the distribution of electrons within the crystal of proteins. From the intensity of diffracted X-ray spots, we can reconstruct the shape of the electron density in our molecule of interest. X-ray diffraction from a crystal of APH(2”)-Ia. The spots are X-rays diffracted from the crystal, and the intensity of those spots is related to the shape of the molecule in the crystal. The further out from the centre, the lower the “resolution” of the data – the better quality structure you can build. This crystal diffracted to ~2.15 Å, or 0.215 nanometers. At this point, the job still isn’t done. In some cases, you have to solve what we call the phase problem, although in this case it wasn’t too much trouble so I’ll jump past it. However, there is still a considerable amount of analysis required to interpret what the electron density means, and what the shape of molecules that fill this electron density truly are. It’s the crystallographer’s job to build a molecular model that recapitulates the observed electron density as closely as possible. The point at which you consider the model “done” is an ongoing struggle, similar to that experienced by artists and writers, where there is always another brushstroke, sentence, or water molecule that could improve the final product, but then at some point you stop and call your model “finished” and interpret what it says about the chemistry of the molecule you’re studying. Part of the model-building process for APH(2”)-Ia. The blue/purple mesh represents the electron density of the molecule, through which I build the model of the protein molecule, with yellow (carbon), red (oxygen) and blue (nitrogen) atoms linked together to form the structure of the protein. The mesh are a transformation of the experimental data, while the sticks built into it are the model of connected atoms that we interpret from this data. The cross in the bottom left represents a water molecule. In the case of APH(2”)-Ia, a lot of the challenge for me was making the models as good as possible, and after a long struggle, they were of sufficient quality that I could use them to gain some interesting insights about how the protein works and suggested a new feature of an antibiotic resistance enzyme. When I started working with APH(2”)-Ia, others had already determined the structures of three related molecules: APH(2”)-IIa, -IIIa, and -IVa. These structures give us the shape of the enzymes and some of their interactions with their substrates, but a key factor always missing was a well-defined active site set of the triphosphate ligand. Without the triphosphate in the enzyme, we can’t get any sense of how the enzyme interacts with that molecule. And if we can’t see it, we can’t predict how it works, or understand how to affect it. Building the shape of the first versions of APH(2”)-Ia weren’t as hard as I’d expected. I had a few nights up late, excited to carry out my next rounds of model-building and improving the data, and was proud to build models with some pretty excellent statistics for the quality of X-ray diffraction data I was working with. The challenge came when I had to start interpreting what was in the active site of the enzyme. Overview of the structure of APH(2”)-Ia. There are four copies (A-D) within the crystal structure, and I blow up one here for illustration. The three regions of the protein, the N-terminal lobe and core and helical subdomains of the C-terminal lobe are indicated. The nucleoside triphosphate binds between the N-lobe and core subdomain, while aminoglycosides bind between the core and helical subdomains. Remember how I talked about how the enzyme takes a phosphate group from GTP and moves it to the antibiotic? Well, in the first structures I looked at, that really didn’t seem possible. I used a GTP-like analogue molecule called GMPPNP to make the protein crystals, and in the structures, the phosphate groups of the GTP analogue were stuck in a position where they couldn’t react with the antibiotic. I named this the stabilized conformation, because it seems to be sitting in a position where it can’t react with anything. There were several similar enzymes I could look to for comparison, and none of them show this stabilized triphosphate form. They have a different, activating conformation which directs it toward the other substrate. I was able to make the molecule adopt the activated conformation, but I had to break the protein by removing an important amino acid to make it let go of the stabilized phosphate. Stabilized and activated forms of the GMPPNP molecule in the APH(2”)-Ia active site. In both cases the magnesium atoms in the active site stay the same, but the phosphate groups (yellow) of the molecule switch to a different location, far from or close to the aminoglycoside, which contacts D374. By removing the S214 contact from the enzyme, the normal enzyme gave us the activated conformation, which suggests that the enzyme normally holds the compound in a stabilized form for some reason. Why? So why didn’t the protein in my structures normally activate the triphosphate? The answer came when I added antibiotic molecules to the crystals. Introducing the antibiotic after the crystals were grown could let us track the changes driven by the introduction of the antibiotic. I had a good idea from other aminoglycoside kinases that the antibiotic would bind in the same position, and initially was just trying to confirm that the antibiotic bound in the same position. As a fortuitous observation, the addition of aminoglycoside substrate drove changes in the shape of the protein, as well as the GMPPNP molecule. The antibiotic activated the triphosphate by binding to the enzyme. The flip between these states gives us a clear way to understand how the enzyme could turn itself “on” when it encounters an antibiotic. Gentamicin binding to the APH(2”)-Ia active site pulls the equilibrium of conformations in the active site from the stabilized to the activated form of the triphosphate group. A hydroxyl group (dark red) of gentamicin lies closest to the activated triphosphate, where it could then be phosphorylated. So, we see a new shape of the triphosphate group that can’t modify the antibiotic. It is held in an awkward, non-reactive form in the back of the enzyme active site. When an antibiotic comes in, the enzyme shifts its shape to respond. In the process of making this change, the GTP triphosphate changes and becomes active. This catalytic switch helps the enzyme keep the GTP inactive until the antibiotic is bound and then activates its triphosphate to a shape that lets it carry out the reaction. This is where we have to speculate a bit. In the stabilized position, the enzyme can’t carry out its normal reaction, but it also can’t carry out a second reaction, called hydrolysis. Hydrolysis is the breakdown of a molecule caused by water. As all biological molecules are found in water, it is always available to react with an activated molecule. Normally, the kinase enzyme should transfer the phosphate the antibiotic substrate. However, when there is no antibiotic around, it’s possible that a water molecule can sneak into the active site and react with the GTP instead. The result of this interaction is that the GTP is broken down, and no antibiotic is inactivated. This wastes precious GTP for the bacterium, so any enzyme that cuts back on rates of hydrolysis will be preferable for the survival of the cell. This mechanism may have been developed to reduce this energy wastage by the APH(2”)-Ia enzyme. In environments where there is a lot of competition and resources are scarce, enzymes that conserve energy are an enormous benefit for a bacterium. This switch between stable and activated forms of the GTP molecule turns parts of the enzyme into a molecular motion sensor for the presence of antibiotics. 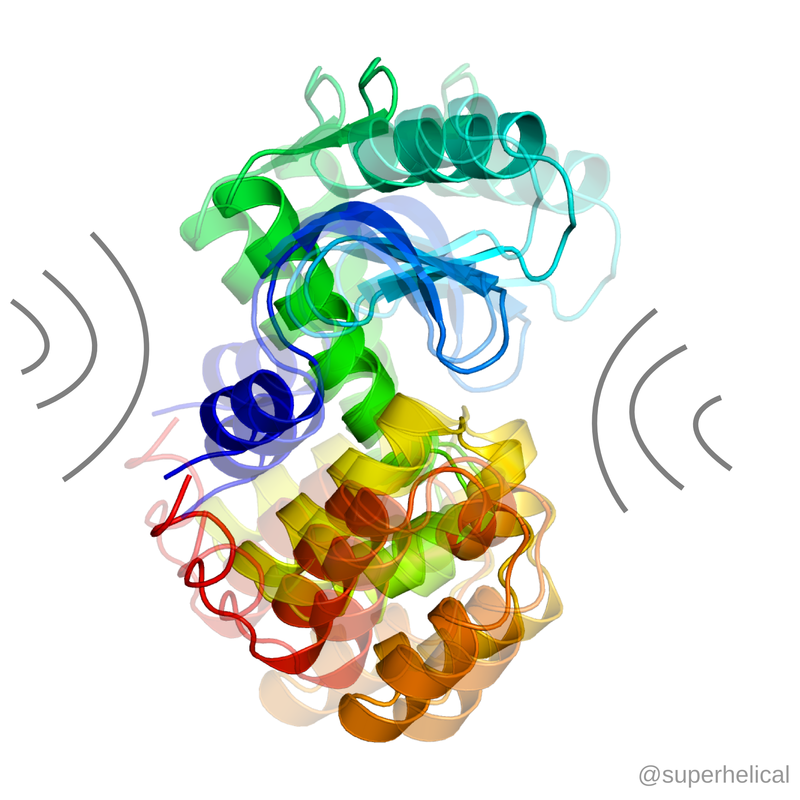 When they aren’t around, the enzyme hangs out and holds on to the GTP, inactive. It’s only when the antibiotic shows up and sticks to a different part of the protein, that the enzyme undergoes changes that activate the GTP. Like a motion sensor-based system to turn your lights off when there’s no one around, flipping between these states might be an interesting way for the enzyme to turn its activity off and conserve energy when it doesn’t have an antibiotic to modify. There’s a lot of places this work leads. I’ve skipped over another interesting finding that two different classes of aminoglycoside interact with the protein despite the fact that only one of those classes can actually be modified. I’ll save that for another blog post. There’s also a lot more detail on the specifics of how APH(2”)-Ia works that I’ve glossed over, which we could also explore some time later. This mechanism isn’t too different from other mechanisms in proteins that carry out various functions in biology. This switch can be considered a type of induced fit or conformational selection of the enzyme, a well-established model for protein behaviour. The thing that makes it different is that this enzyme is an antibiotic resistance enzyme. Usually antibiotic resistance enzymes aren’t thought to be very complicated. They are thought to be inefficient but highly active machines to turn off antibiotics as fast as possible. This work shows us that an antibiotic resistance factor can be modulated and subject to regulation in a way that reduces its energetic waste. How about the bigger picture? Taking the inference a step further, this induced activation of the enzyme indicates that there is a greater complexity in the action of this enzyme than we previously might have expected. However, it isn’t as surprising as we might think when we remember that many antibiotic resistance factors have been around for millions of years, with a very long time to optimize their catalytic activity. We treat antibiotic resistance as something that pops up fresh when we use antibiotics, but the truth is, like we’ve discussed before, there are some forms of ancient antibiotic resistance are highly fine-tuned and regulated to respond to challenges in their natural environment. APH(2”)-Ia is one resistance factor among many. This paper shows us that resistance factors need not just be catalytically optimized machines, that they can contain a degree of fine-tuning that regulates their activity. This nuanced activity is supported by long periods of evolutionary selection to produce highly effective resistance enzymes, ones that lead to terrifyingly effective antibiotic resistant microbes. We now understand one factor a little bit better, and hopefully that helps us just a little bit more in our efforts to beat back the surge of antibiotic resistance. How do you make a new protein, or a new function in an existing one? This is the goal of the field of protein engineering. Researchers working in this field use a number of strategies to try to make proteins with new characteristics. The development of proteins with new function have applications in industry, medicine, and biotechnology. Want a more stable or more efficient enzyme? Talk to a protein engineer. Want to convert a protein with one function to a completely new activity? talk to a protein engineer. Want to make a molecule with a function never before seen in nature? talk to a protein engineer. I was able to hear from many working in the field this weekend at the second iteration of the Protein Engineering Canada meeting, held at the University of Ottawa. The meeting was brief but full of excellent talks. There were some common principles that kept coming up that I’ll try and summarize here. Elan Eisenmesser gave an excellent talk about protein dynamics and mentioned how “the worst thing to happen to biochemistry was biochemists”. The argument is that biochemists like simple, reductionist models, but as we’ve studied proteins and how they work, we know the truth remains much more complicated than that. Many times to change the function of a protein, changes far from the site of interest are necessary, and we remain pretty terrible at predicting what those might be. In many talks at this meeting it came up that the most effective modified enzymes are typically achieved through non-intuitive mutations. So, if we limit ourselves to deterministic changes where we predict the results, we may miss most possible opportunities to develop new properties in a molecule. Rational approaches can lead us the wrong way – screening of many different sequences are necessary to find proteins with desired properties. We may someday be able to predict function from sequences alone, but those days remain far in the future. The number of possible sequences even in a relatively small protein are astronomically large, 20 residues raised to the power of the number of residues in the protein. As a result, it’s never possible to screen for function in every possible sequence. It is always necessary to reduce the number of testable sequences and structures of proteins to test to a manageable level, and this needs to be done in a smart way. Two strategies of screening a restricted library presented were Tim Whitehead’s group’s strategy of systematically replacing every amino acid in a protein with every possibility and compete the bacteria against each other to try to alter function. Another method was Justin Siegel’s to look to nature and the diversity of sequences in the environment to find better proteins that have developed in the wild. These strategies guide us to finding new functions without having to individually screen 20100 individual proteins, something that we would still be doing until the death of the universe. It’s much easier to break something than to build it new from scratch. This is a fact of life, dictated from the rules of thermodynamics. But, at the same time, it’s surprisingly easy to build something. Michael Hecht gave an excellent talk indicating how his group has made a library of brand new proteins, and screens them for function. He described that for some functions, many new proteins could carry them out, without any evolution to tune the protein’s activities. So, if you have the right type of function, it might be possible to find that function in randomly-generated (although constrained) protein sequences. This has some pretty profound implications for understanding the origin of life as we know it. The finding from this work, and in the analysis of a large family of enzymes presented by Janine Copp was that you can relatively easily get weak, promiscuous activity from primitive enzymes, which then are refined to more specialized proteins with higher specificity and activity. This is the case in nature, and also now in the lab where researchers develop new and better functions in proteins by driving them to specialization. Similar to problems with reductionism, an assumption that x-ray crystal structures have convinced many of is that proteins are mostly rigid and don’t move much as they carry out their function. This isn’t really true, I’ve ranted before on this site about why we need to undersand molecules are jiggly. Proteins are nearly chaotic, with interconnected networks of interactions that drive their function. A recurring theme in this meeting was that an understanding of dynamics is necessary to develop a good grasp of function and how to change it in a molecule. Many talks including Sophie Gobeil’s talk on an antibiotic resistance enzyme and Adam Damry’s award-winning talk on engineering of a dynamic function in a protein touched on these points. It is necessary to understand dynamics to predict function, and while this remains challenging, it is possible to develop some predictive insights through carefully constructed experiments. The emerging art of protein design is starting to mature, guided by a more comprehensive understanding of protein function, and smart strategies of how to get there. I’m excited to see where the field is headed! In addition to all this work on engineering of proteins, my jaw dropped to see some of the amazing new T3SS structures coming out of Natalie Strynadka’s group, and Martin Schmeing’s presentation of his group’s megaenzyme studies, appropriately set to Miley Cyrus and Taylor Swift. Overall, an amazing meeting, I hope to go again in 2018. If you’re interested in protein design and engineering, I can’t recommend the meeting enough. Hope to see you there. Lots of things can make us cry. Pain. Joy. Boredom. Sadness. Toy Story 3. There’s another common source of tears in any home, and it lives in the kitchen. Onions and other plants in the Allium genus produce compounds that trigger an involuntary reaction. Chopping these bulbs turns even the most stoic into a weeping mess in minutes. What makes this happen? Does the onion want us to be sad? Does it want us to share in its misery? Does it want to inflict the same pain upon us that we inflict on it? How does a simple vegetable have that much power over our tear ducts? The answer lies in biochemistry. Despite their unassuming appearance, onions pack powerful chemical weapons, ready to launch upon us at a moment’s notice. The main compound produced by onions is called the lachrymatory factor. This chemical has an unusual chemistry for a biological molecule, because of one atom. Sulfur. If there’s ever weird chemistry happening in the cell, you can bet that sulfur is probably involved. Let’s explore why. Sulfur is interesting in biological chemistry because it can do much more than most other abundant biological elements. In its simplest form, sulfur can link up with hydrogen, to form H2S, the main ingredient of sewer gas and other unpleasant biological emissions. If you ever run in to a smell like rotten eggs, there’s a good chance sulfur is involved. Sulfur’s superpower is its large number of stable oxidation states. A common and stable form of sulfur is sulfate, when the sulfur is linked to four oxygen atoms. Three oxygens is a sulfite, two a sulfinic acid, and one gives you a sulfenic acid. This versatility lets molecules with sulfur do a lot of things that other biological molecules can’t. Sulfur can also form more complicated compounds when you add in carbon and nitrogen, creating compounds like vitamins B1 (thiamine) and B7 (biotin), antibiotics penicillin and sulfanilamide, and the critical biological molecule coenzyme A. Sulfur also forms an integral part of protein molecules linking to carbon atoms in the amino acids cysteine and methionine. The sulfur atoms in cysteine can link with itself to form disulfides, an important part of its role in protein molecules. It can also link to oxygen atoms in a variety of ways, which let it respond to the oxidative environment, build unique compounds, including many with biological roles. Because sulfur is happy to ignore the common rules of molecular bonding that carbon, nitrogen, and oxygen tend to obey, if frequently is used when non-typical chemistry is needed. Cells use a sulfur-containing cofactor to shuttle methyl groups around the cell, and use the sulfur-containing vitamin B1 to carry out many complex biochemical transformations. Lachrymatory factor is another great example of this chemical versatility. The compound is an S-oxide or sulfoxizime compound. This means it carries a positively charged sulfur and negatively charged oxygen atom, directly bonded to each other. This breaks a rule that we teach in organic chemistry that you cant form stable covalent molecules with positive and negative charges adjacent to each other. Unfortunately, this is one of those rules that is more of a guideline than an actual rule, and sulfur is happy to ignore it. That said, this arrangement of atoms in the lachrymatory factor is not stable over the long term, so it can’t be made in advance and stored for long amounts of time. It’s also a gas, so hard to contain within a plant’s tissues. So how does the onion release it so quickly when you cut into a bulb? It’s got a hell of a defense mechanism. You don’t dare kill it! In the Alien series, the blood of the xenomorph creatures is toxic and corrosive. Attack and injure the alien, and it spews this toxic acid, corroding whatever it comes into contact with, including any humans foolish enough to attack in the first place. This serves as a pre-emptive defence for the alien. Hurt me, you’ll get hurt, too. The same strategy plays out with many plants. Plants can’t move in response to predators, so they protect themselves in a different way, with chemistry. When their cells are damaged, they produce noxious chemicals to turn away their predators. These chemicals can take many forms and actions, sometimes poisoning us, often having no effect, but sometimes having beneficial pharmaceutical properties, that help us treat disease. In fact, many potent pharmaceuticals come from plants. Lachrymatory factor plays this role for onions, in the same manner as allicin does in garlic, and a different class of sulfur-containing compounds does in cruciferous vegetables like broccoli. Herbivores or insects who try to eat the plant will be overwhelmed by noxious chemicals, and look elsewhere for their dinner. But how does the onion actually make the compound when it’s injured? Onions generate the lachrymatory factor on the spot, immediately after tissue damage. It does this using a smart solution – keep the two elements that generate the noxious chemical separate, and only allow them to come into contact if tissues are damaged. Onions generate the lachrymatory factor by breaking down precursor molecules using enzymes called alliinases. This releases the lachrymatory factor into the air, to wreak havoc on our tear ducts. Onions keep these precursor molecules (alkyl cysteine S-oxides) and the enzymes needed to make them in different compartments, so they do not normally meet. When you slice into them with a knife, the cells are broken and the enzyme and precursor molecules meet. As the enzyme starts to break down the precursor, it releases lachrymatory factor*, which diffuses into the air. This reaction happens fast, but not instantaneously, which explains how it can take a minute or two for the vapours to accumulate enough to cause problems. As soon as the plant is damaged, it starts producing lachrymatory factor, but it takes a few minutes to accumulate enough to affect us. If you feel you’re a tough individual, it can be pretty embarrassing to break down in tears in the kitchen. That should be reserved for when you finish reading Where the Red Fern Grows. So how can you keep the onion tears away? We know two things: First, lachrymatory factor is produced by onions in response to injury when enzyme and precursors come together. Second, lachrymatory factor is a gas that is released from the onion’s tissues into the air around us. Based on these two facts and the basic principles of chemistry, what can you do? Work fast. It takes time for the alliinase reaction to take place, so the shorter the time freshly cut onion is in the open, the better. Use ventilation. A fan (preferably one that vents outside) can whisk the vapours away. Cool everything down. Enzymes work much faster at room temperature than at refrigerator temperature, so cold onions will produce less compound. Gases are also less volatile at colder temperatures, which also reduces how quickly it migrates into the air. Once it’s cut, heat it all up. Once an enzyme is denatured, it’s dead and doesn’t work any more. Enzymes can be denatured by cooking, and sometimes by acidic or basic treatment. Another reason to work efficiently – get those onions cooking, and they’ll stop making the chemical pretty quickly. Onion Goggles? No. Don’t do this. Just don’t. So, if we know just how this noxious chemical is produced, is there any way we could reduce it altogether? This has been done by a group in 2008. By reducing the amount of one of the enzymes involved in making lachrymatory factor, researchers could greatly reduce the production of the chemical from these onions. In the process, the onions even seemed to make more of other flavourful, sulfur-containing compounds, so this work certainly looks promising. One interesting consideration with a lachrymatory factor-free onion is that it might be a lot harder to grow – the chemical is a form of defence against herbivores and insects, after all! Not much word on this work since then, but if it isn’t already underway, I’m certain new technologies might make this even more feasible in the near future. Every time I make dinner with onions, I’m reminded and hope we get one soon. A tear-free onion can’t come soon enough for me. To fully understand a molecule, you first need to learn what it looks like, and then, how it moves. This isn’t easy. I’ve talked before about how unusual biological molecules can be if you’re accustomed to thinking of real-world objects. They are fundamentally flexible and dynamic in a way that everyday objects aren’t. They move chaotically, at lightning speed, crashing through a molecular mosh pit on the sub-microscopic scale. Protein and nucleic acid macromolecules are like Rube Goldberg machines of interconnected parts. These parts move independently, but in turn influence the other parts of the system as they move. There’s different levels of complexity in this motion. Slow conformational transitions that move large sections – domains – relative to each other can take milliseconds to occur. Ultra-fast bond vibrations take only picoseconds. That’s a difference of nine orders of magnitude. In the time of a single slow domain movement, a billion bond vibrations can occur. In monetary terms, this is the difference between one cent and ten million dollars. This is what biophysicsts refer to when they talk about “timescales of molecular behaviour“. Different types of molecular motions take dramatically different lengths of time to occur. We can only measure a subset of these motions with any one experimental technique. When we try to fully understand a molecule, we need to be aware of all of its motion across all timescales. Unfortunately, we are terrible at understanding things that span such a broad range. Our brains are trained to think about everyday objects we can see, touch, and manipulate. Microscopic molecules act in ways that make absolutely no sense on the scale of our experience. To help make sense of this strange behaviour, we need a good metaphor. What does a molecule have in common with a musical note? You might not be able to think of any way these two things are related (you also might also be wondering what I’ve been smoking). A molecule is a collection of atoms, connected by shared electrons. A note is a small part of a Bach sonata, jazz solo, or Call Me, Maybe. Well, we’ve discussed before how the context a molecule is in is critical for understanding downstream effects. A musical note, as well, gains more meaning by the context it is placed within. The same note means different things if it’s played within a different song, or if it comes from a pan-pipe versus an electric guitar. But even isolated molecules and isolated musical tones share something fundamental in common. They both display a complexity of vibration, with finer, more detailed vibration superimposed on top of slower, lower-frequency behaviour. To a first approximation, a note is just a frequency of sound. Children of the ’90s will remember that before Napster, we could download MIDI files from the internet to play as music. Many computer sound cards rendered the tones of the MIDI as pure tones, which reflects the format the note is stored as in the MIDI file. The end result is completely devoid of soul, a heartless distillation. It lacks any of the complexity of actual recorded music. The notes are there, but without details and imperfections of that come from real instruments, it seems hollow. Real musical instruments produce so much more than just pure tones. We know that the character of an instrument changes the nature of the sound it produces. A B♭ from a trumpet and a B♭ from a clarinet sound different to us, despite both having same fundamental frequency. What makes them sound different from each other, and from a MIDI file? In one word: overtones. Every instrument layers higher-order resonances – vibrations – on top of the fundamental tone, and those resonances are dependent on the shape, material, and other properties of the instrument. Vibrational overtones add complexity and texture to an instrument’s sound. While the main pitch of the note is the same, the structure and character of the instrument produce different superimposed frequencies that make it unique. Like the air perturbed by a musical instrument, molecules also vibrate. These vibrations and movements are central to their function. Individual atoms undergo high speed vibration. Chains of multiple atoms turn and bounce in unison. Loose loops and “floppy bits” of dozens to hundreds of atoms contort, twist, and wiggle. Whole domains can migrate back and forth between different states. Like overtones on a musical note, these motions are superimposed on each other. While large domain movements occur, loops are wiggling, within those wiggles, amino acid side chains are bouncing, and during those bounces, individual atoms vibrate across every bond in the molecule. Rotation and vibration of atomic bonds follow an energy potential pretty close to sine waves. Combining the motion of those atomic vibrations and rotations across multiple atoms produces an emergent complexity where the arrangement of atoms across one bond can influence that of the nearby atoms, and by extension, the rest of the molecule. In theory, we might be able to work out how these energy potentials govern the behaviour of a single molecule. Alas. Were it only that simple. In the change of structure of a molecule, small transitions of single atoms can be layered on top of larger motions. The motion of an atom depends on its own vibrations, as well as that of the rest of the molecule around it, pushing and pulling it along with larger changes. This feeds both ways. While a large transition occurs, vibrations and rotations of progressively smaller components can also exert their collective effects on the entire molecule. This chicken-and-egg problem is a big part of why the behaviour of molecules is so hard to predict, even when we know its structure. It leads to a computational problem that rapidly gets too complicated for even the most powerful supercomputers to handle easily. So just because you know the shape of a molecule doesn’t mean you can capture the full essence of its character. Like a musical note, a molecule’s shape is just the starting point to understanding the complex way it acts on itself and its environment. Static molecular structures are like notes printed on a page. Dynamics* are those notes, played aloud, containing much more richness than the printed note alone contains. When we combine multiple musical notes, the complexity grows even greater. Multiple notes from a single instrument like a guitar or piano interact with each other to form chords. Different instruments in a band or orchestra combine together to further increase the complexity. All of these interactions combine together to make a symphony much greater than the sum of its parts. Likewise, combination of motions within molecules also adds to a complex whole, where the collective motion of thousands or millions of atoms can lead to much more nuanced patterns of behaviour than we might otherwise expect. Two macromolecules, playing their own melodies, can come into contact (bind) with each other, and if so, they join together in harmony. These molecules become a single, resonating entity, sometimes for a brief exchange, other times for much longer. Just like in a symphony, the complexity grows even more as we scale up interactions of molecules to complexes, signalling pathways, cells, and even whole organisms. This intricate opera underlies all biological processes. So, if molecules are so complex, how can we make any sense of their messy behaviour? In science, we don’t aim to simply appreciate nature, but to understand it and make predictions about the future, and to generate changes that help us innovate on existing phenomena. Our metaphor of a molecule as a musical note becomes useful to help us move from thinking about how a molecule is to how it might change. Ask any manufacturer of a musical instrument: changes to small details of a musical instrument can dramatically influence the quality of sound you get. This is the same with molecules – changes that alter the dynamics change the character of the molecule. For example, in a protein, biological activity frequently requires large movements between domains of a protein, as well as finer motions of hinge regions, short loops, and amino acid side chains. Changes to a molecule, by post-translational modification, mutation, binding to another protein, or allosteric regulation can distort or modulate the dynamics of a protein. They change the tune of the molecule, by altering its resonances. This resonance-tuning feature of proteins has led to many mysteries in the literature about macromolecules. With surprising frequency, mutations are found that disrupt the activity of a protein, despite being far away from the business end (the “active site”) of the protein molecule. These reductionism-breaking proteins have caused many a biochemist to throw up their hands in dismay at the apparent lack of connection between a mutant protein they identify and their observed change in molecular function. Happily, though, we’re starting to track down the culprit: dynamics. Changes to a molecule that have very little structural change can still alter the molecule’s vibrational frequencies. A protein with an amino acid important for dynamics changed is like a band whose bass player is hung over and can’t keep time. A paper from earlier this year demonstrates this effect very well. It came from Dorothee Kern‘s group at Brandeis. Looking at two well-known protein kinases(PMC) and reconstituting the evolutionary and biochemical pathway between the enzymes, the group found that there’s a small set of amino acids that drive the change in behaviour between the enzymes. Almost none of these amino acids are directly involved in the chemical behaviour of the protein. Like making alterations to an instrument, these mutations tune and refine the dynamic properties of the enzyme, and direct it toward different behaviour. Molecular and structural biologists are just starting to get a good understanding of the role of mutation and chemical change to altered dynamics and function of proteins. I’ll be watching this field closely for future developments. The analogy of molecules as musical notes with harmonics isn’t perfect. Music depends on perfectly repeatable, precise tones (that’s not to say innovation and improvisation aren’t important, but they use the same, standard notes). Molecules have an intrinsic chaotic nature that is not really predictable at all. But while the molecule is unpredictable on the microscopic level when you look closely, take a step back and the molecule starts to average out into predictable, regular rules. From a stochastic and random process on the microscopic level, step back farther and farther, and a kind of predictable order emerges. There’s also a difference in scale. The first overtone of a note is merely twice the frequency. Proteins have motions at least 9 orders of magnitude different. However, we could compare it to the difference in loudness our ears can perceive, the difference between a bond vibration and large macromolecular rearrangement is about the same difference in magnitude as a pin dropping when compared to a loud rock concert. The musical analogy isn’t perfect, but it helps understand a hugely complex system with thousands or millions of moving parts in a more intuitive way. Molecules are alien entities, very different than anything we interact with in our everyday lives. Their actions are determined first by their structures, then by their dynamics – how those structures move and vibrate. The structure and movement of these molecules results in a complex molecular symphony going on at the microscopic level. And from the single complex note that one molecule makes, it can be tuned by others, harmonize with partners, and join in with the grand symphony that goes on in the complex molecular opera of life. Dynamics are a frontier of structural biochemistry research (a Grand Challenge, if you will). Moving forward, we continue to chip away at the mysteries of how molecules work and learn how to better predict molecular behaviour. Every time we do so, we get a little bit better at listening to the complex arias and beautiful harmonies these molecules play. Our ear gets a little bit more refined, our appreciation of this molecular orchestra more acute. The symphony goes on all around us, can you hear it? * I’m using the definition of dynamics as it relates to molecules here, as in the field of molecular dynamics modelling. The term dynamics as it relates to music is a slightly different concept than anything we’re discussing here, so I’ll skip over it. A molecule is intangible. It’s too small to see, too small to feel. Trillions could fit on the sharp end of a pin. These strange entities lives in a world very different from our own, at the boundary between quantum uncertainty and statistical chaos. Many processes in chemistry, biology, and medicine depend on our understanding of molecules in this alien world. However, it can be a challenge to accurately represent what molecules are really like. To simplify things, we often cheat and draw them as “blobology” – featureless coloured circles and squares. If we have structural data, we can do better and present them as a ball-and-stick models, ribbon drawings, or molecular surfaces. While helpful, these more detailed representations are still cheating. Images of a molecular structure all share a major limitation: they’re static. They don’t move. A molecule’s function depends not just on its structure, but in the change of structure as it interacts with other molecules. This includes large, dramatic movements that translocate thousands of atoms, small movements of individual atoms, and everything in between. Macromolecules that carry out biological processes contain thousands to millions of atoms, each with some freedom of motion. They are intrinsically dynamic and flexible, and this motion is critical to our understanding of how they work. I’ve mentioned before that I often think of molecules like LEGO, snapping together to build more complicated systems. But if we think about jiggly molecules, we should think less “brick” and more “jellyfish”, “slinky”, “JELL-O”, or “Flying Spaghetti Monster“. This is a case where a descriptive adjective can be really helpful, like greasy polypeptides, oily odorants, fuzzy electron density, and squishy polymers. How can we best describe biological macromolecules? They’re jiggly. A drop of water may look serene, but on the molecular scale, it is a violent mosh pit of collisions between molecules. Think soccer riot, demolition derby, or a playground full of kids on espresso. Particles move in all directions, flailing about wildly, constantly crashing into each other. Inside a biological cell, the chaos is even wilder, with thousands of different types of molecule bumping, wiggling, twisting, and squirming around. The Brownian motion of particles in this soup puts molecules in a state of constant fluxuation and vibration. They bend, twist, and bounce. They sample an almost infinite number of shapes, switching between states at breakneck speed. While molecular scientists understand the complexity of this world, we can skim over it when communicating our work. Worse, sometimes we outright forget. We talk about how “the structure” of a molecule was solved. We assume that the shape of a molecule determined from crystals represents its shape at all times. We pretend that “disordered” parts of the molecule don’t exist. In many cases, these approximations are good enough to answer the questions we want to ask. Other times, they hold us back. We should always remember the importance of flexibility. But if we know that molecules are intrinsically flexible, why do we fall back to talking about static shapes? The technology we’ve used to study molecules, and the history of the field have both played a role. Structural biology has been an extremely powerful set of techniques to look at the high-resolution structure of molecules. But limitations of these techniques have trapped our thinking at times to picturing molecules as static, blocky particles. X-ray crystallography and electron microscopy calculate an average structure, which represents a huge ensemble of possible conformations. We sometimes refer to parts of molecules we can’t resolve by these techniques as “disordered”, although what we really mean is that is that all of the molecules we are looking at have different shapes, and we can’t average them into a meaningful representative model. As a byproduct of the technique, we miss some of the forest for trees. Other techniques like nuclear magnetic resonance (NMR), more easily acommodates multiple models, but because of the precedent set by crystallography, we still frequently treat NMR structures as a single model. These techniques also bias us toward samples that are “well-behaved” – that is, they easily crystallize, purify, or otherwise make the life of the scientist easy. The problem here is that the molecules that purify or crystallize more easily are often those that show less flexibility. Lab lore dictates that flexible molecules cause problems in structural biology labs. As a result, scientists have picked a lot of the low-hanging fruit, leaving the most flexible (and some might argue, most interesting) molecules alone. As structural techniques mature, they are beginning to seriously tackle the idea of flexibility, but we still contend with a historical legacy of studying the easier, less flexible molecules. The history of biochemistry has also affected our thinking about molecular flexibility. The history of the field tracks our growing understanding of how large molecules work. With more data and more powerful techniques, we have developed increasingly nuanced ways of thinking about these complicated microscopic machines, but that history leaves a legacy. Without knowing details of molecular structures, the first biochemists were left to assume that strings of atoms will exist as a floppy or disorganized shape in solution, waving around unpredictably. This was changed by the father of biochemistry, Emil Fischer. In 1890 he proposed a model that changed how we viewed biological molecules. The “lock and key” model involves two molecules with rigid, complementary shapes. Features of the smaller molecule (the “key”) perfectly match features of the larger (“lock”) so that they can specifically interact. A well-defined, rigid structure is necessary for this mechanism to work. However, alongside Hofmeister, Fischer also determined that biological macro-molecules are made as flexible chains of atoms. This raises a problem. How does a floppy string-like molecule become a blocky shape that can form the “lock” to interact with its “key”? This problem wasn’t conclusively resolved until 1961. Anfinsen showed that the sequence of atoms in one of these floppy chains can guide the molecule to adopt a compact, blocky shape spontaneously on its own, by interacting with itself in reproducible ways encoded in the molecular sequence. The understanding that came from this work came to be known as Anfinsen’s Dogma: One sequence makes one structure. This is the blocky model of macromolecules, where floppy chains of atoms fold into a reproducible, rigid, blocky shape. More than 50 years after Anfinsen, the idea persists that molecules fold upon themselves to this single, rigid state. We know a lot more now than we did in 1961. We know that folded molecules keep some fundamental flexibility and still move and jiggle, despite their folded shape. Anfinsen’s Dogma isn’t incompatible with this understanding, it only needs one concession: Folding a molecule into a three-dimensional shape restrains a molecule’s flexibility, but doesn’t remove it. Over the intervening years, more complicated models for molecular behaviour have emerged that take flexibility into account. These models can sometimes still treat flexibility as the exception rather than the rule, but are a welcome improvement. Biochemists and biophysicists fight over the relative contributions of competing induced-fit and conformational selection models. Despite this bickering, these models are compatible and are starting to be reconciled in a new synthesis of molecular flexibility and action. Key to understanding this phenomenon: jiggliness. From floppy to blocky, this is now the beginning of the jiggly-molecule paradigm. Prediction of two interacting molecules. Fischer’s lock and key model is conceptually useful, but high-resolution models have shown that it is usually too simplistic. Upon interaction, molecules will change shape as they come together. It’s a rubber key in a JELL-O lock. Because of this, it is still almost impossible to predict the productive interaction of two molecules without accounting for flexibility. Determining the impact of amino acid changes on molecular function. Reductionism often fails when we try to pull apart the action of a single amino acid on a protein’s function. While we can make changes that disrupt interactions, prediction of changes that form new interactions requires understanding dynamic flexibility. We also know that mutations that have no effect on the protein structure can have dramatic effects on dynamics, and hence function. Allosteric effects are still impossible to predict. Changes caused by binding of a compound that alter a molecule’s properties are almost never easily determined by their shape alone. Flexibility, dynamics, and interaction energies are critical to understanding how allosteric transitions take place. The active state of a protein is not well populated in experiments. The state of a protein that carries out its function is almost always not the “rest state” – that is, the most stable state. We find low-energy states in crystallography and other techniques, but the states of proteins that are poorly occupied are frequently the most important states. We usually have to infer the active state from the data we are able to measure. Understanding dynamics and flexibility are necessary to learn and model how molecules reach their active state. 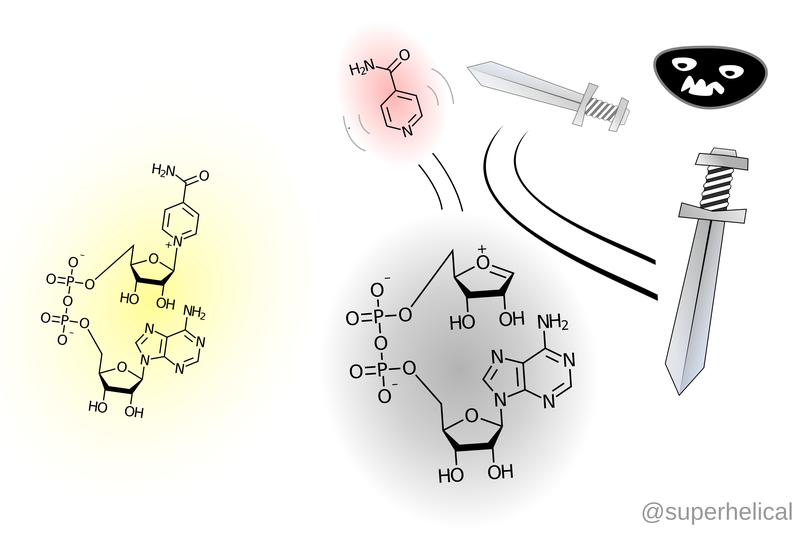 Move past static structures – Embrace the molecular jiggle! The paradigm of the jiggly molecule is starting to take hold. New technologies like free-electron lasers and improved cryo-electron microscopes are starting to allow us to look at single molecules. This will allow us to directly observe states of molecules and compare them. Single-molecule fluorescence and biophysical studies let us harvest data from single particles, to appreciate the subtleties of their action. Molecular dynamics simulations get us closer to an ensemble-level understanding of molecular data, and are more powerful every year by Moore’s law to model complicated and flexible systems of molecules. Well-designed experiments can use NMR techniques to their true potential, to probe the flexibility and structure of biomolecules. Although in their infancy, ensemble methods are starting to be used in crystallography and scattering methods. Hybrid methodologies further combine information from many sources to begin to integrate into comprehensive models. The developments I’m most excited about, however, have come from outside of the scientific world. Developments in animation are bringing the molecular world to life, and animators are merging the science and art of displaying molecules. The jiggliness of molecules becomes completely clear once you observe them in video. Viewing the movement of a simulated molecule grants an intuitive understanding of the world of a molecule much better than a 1900-word blog post ever could. If a picture is worth a thousand words, an animation is worth a billion. Professional molecular animators are using experimental data to inform their illustrations of molecular behaviour. As we move from publication on printed paper journals to digital publication, these animations will play an ever-larger role in illustrating the behaviour of substances on the molecular level. An intuitive understanding of jiggly molecules opens up a new level of problems we can approach in biochemistry. No matter what you know about molecules, appreciate the complexity these dynamic, flexible objects show. Appreciate and embrace the jiggle. If things are just right, the molecules might embrace you back. If you cant defeat your enemies by force, defeat them with subterfuge. Mycobacterium tuberculosis, the bacterium that causes tuberculosis, lives by this mantra. While other disease-causing bacteria mount an all-out assault on the body, the tuberculosis bacteria lay low, hide, and slowly kill us from the inside out. M. tuberculosis is a master of stealth and deception. Like the Greeks entering Troy in a wooden horse, it hides from the immune system within our own cells – often the very same cells that guard us from bacterial infections. M. tuberculosis is a treacherous enemy. In order to infect us, many bacteria use protein toxins to kill or manipulate our cells. The cholera and diphtheria pathogens are famous for producing toxins that attack our tissues. These toxins are fired as cannon blasts that break into our cells, and chemically change our own molecules to drive a toxic effect. Until recently, we thought that M. tuberculosis didn’t have any of these toxins. We thought that it accomplished its stealthy invasion through other means. It turns out, we were wrong: M. tuberculosis has a toxin, but it’s not a cannon, it’s an assassin’s blade. Last year, researchers at the University of Alabama at Birmingham identified a toxin from M. tuberculosis that kills immune cells. They named the enzyme tuberculosis necrotizing toxin, or TNT, because it induces necrosis, or cell death, in the target immune cells. In a recent follow-up, they have now demonstrated exactly why the toxin is so deadly. The TNT toxin is particularly nefarious. Rather than the upfront assault of the cholera and diphtheria toxins, it kills its host cells from the inside out. TNT breaks down the cell’s stores of NAD+, or nicotinamide adenine dinucleotide. This molecule is an important energy carrier molecule*, used by all life forms from the tiniest bacterium to the giant sequoia. Our cells use NAD+ to shuttle energy between biochemical processes. NAD+ harvests energy from the breakdown of glucose and other molecules, and passes that energy to other systems that drive the processes of life. If you remove a cell’s NAD+, the cell will die. This makes NAD+ a convenient target for M. tuberculosis. Destroy the NAD+, destroy the cell. TNT Enzyme Decapitates NAD+. Artist’s Interpretation. The tuberculosis bacterium uses the TNT toxin to do exactly this. It acts the assassin’s blade, selectively destroying all of the NAD+ in the host cell. The enzyme “decapitates” NAD+ by breaking a critical bond, separating the head from the body of the molecule. Without their stores of NAD+, the immune cells that host the tuberculosis bacteria die, releasing them to spread to other cells. Triggering necrotic cell death also bypasses more orderly means of cell death that would allow the immune cell to sacrifice itself and quarantine the mycobacteria. In tuberculosis, some of the worst symptoms aren’t mediated by the bacteria themselves, but the immune system’s inappropriate response to the bacterium. This is part of why it wasn’t always clear that M. tuberculosis would need a toxin at all. For the most part, the M. tuberculosis lies low, waiting for its chance to strike. When it does strike, it appears to use TNT to do so in a selective and controlled way. Like the Greeks crossing the walls of Troy, the TNT enzyme has to be helped across a membrane to the host cells. Mycobateria live within compartments in the cells they infect, but in order to disrupt the metabolism of those cells, the toxin needs to reach the cytoplasm. TNT doesn’t contain any functions to get it into the cytoplasm by itself, so it has to be helped, by an export complex called ESX–1. This is different than the cannonball toxins of cholera and diphtheria. Those toxins have their own means of forcing their way into a target cell. The TNT enzyme is actually a small enzyme, which means it doesn’t carry any parts to help cross into the host cell by itself. The researchers identified that the ESX–1 system is needed to get into the cytoplasm, although there is still a huge amount unknown about this process. This is a very interesting area of future study, because moving TNT into the cell probably involves an important switch in the bacteria’s strategy. M. tuberculosis switches from lying silently in wait, to mounting its sneak attack by cover of darkness. There is an interesting consideration for any bacterium that makes a toxin, especially one that targets a ubiquitous molecule like NAD+. How does M. tuberculosis avoid killing itself? The bacterium synthesizes the toxin inside its own cells, but NAD+ is important for all life, including M. tuberculosis itself. How does the bacterium keep the TNT enzyme from destroying its own NAD+? Well, if this toxin is the assassin’s sword, a second protein, IFT (immunity factor for TNT), is the scabbard. When the TNT enzyme is made in the mycobacterium, it is secreted, but if it somehow remains in the cell, it is bound by a molecule of IFT. This IFT blocks the part of the TNT enzyme that interacts with NAD+, inhibiting the enzyme. The researchers determined the structure of TNT and IFT together, and showed convincingly how the IFT would completely block TNT activity by obstructing the interaction of TNT and NAD+. Outside of the bacterium, TNT and IFT are separated, and the toxin is active. Inside the cell, IFT acts like the sheathe that protects a swordsman from their own blade. It’s a cleverly-evolved means for M. tuberculosis to protect itself from its own weapon. The TNT enzyme is a great example of a reductionism-breaker. In a lot of molecular biology, if you want to probe an enzyme’s activity, you create site-directed mutants. In these mutants, the functional amino acids that interact with the target of the enzyme are replaced with non-functional amino acids. In this way you can test, in a straightforward way, what role the individual amino acids play. Reduce the activity of an enzyme to its constituent amino acids. If you replace a functionally critical amino acid, you expect to get a non-functional protein. In TNT, removing the amino acid most important in related enzymes only reduced TNT’s activity by half. This isn’t much by molecular biology standards. This highlights that even though the same residue is present in this enzyme as related toxins, TNT appears to play by different rules than the rest. This actually is a fairly common story when studying enzymes, especially ones that are involved in bacterial disease**. A lot more work is needed to map out the mechanism that this enzyme uses, but this is a great reminder not to assume similar enzymes work exactly the same. Why do I like this paper so much? The researchers discovered the NAD+-breaking activity of the enzyme through some extremely clever detective work. They observed that when they produced the toxin in standard lab E. coli bacteria, the E. coli died. This happens occasionally, even with proteins that aren’t toxins. The next step they took was key. They sequenced the RNA of the expression bacteria, and found that the E. coli had up-regulated genes responsible for the synthesis of NAD+. Some other bacterial toxins break down NAD+, notably another toxin produced by S. pyogenes. The researchers tested if TNT also acted on NAD+, and found the enzyme carried out the same reaction. I think this is a great case of critically evaluating your lab materials, and sharp thinking about the systems you work with. In this case troubleshooting lab problems appears to have turned into a huge discovery. This research also identifies the first known bacterial toxin from M. tuberculosis. This bacterium is notable within microbiology because it tends to always play by different rules, growing slowly, using distinct chemistry and metabolism for everything it does. It would be easy to believe it fights the immune system in different ways, as well. This is partly true, as the TNT toxin is quite different from any other known toxin (it couldn’t be identified by comparisons to known toxins). But it seems M. tuberculosis uses a familiar weapon, just in an unfamiliar way, fitting its stealthy mode of infection. Lastly, TNT and IFT are an interesting case study of the identification of unknown gene functions. The M. tuberculosis genome was sequenced in 1998. The NAD+-destroying function of mycobacteria was seen in the 1960s, as was the inhibitor function of IFT. However, without the appropriate understanding, no one could connect these functions to the genes until now. While modern sequencing technologies help us compile long lists of genes, we still need smart, careful experiments like this study to work out just what these genes do. It’s a great example of careful, inquiry-driven research in the post-genomic era. M. tuberculosis uses the TNT toxin to decapitate a molecule that our immune cells need to live. A stealth murder weapon wielded by a treacherous infiltrator. This paper is a great piece of work illustrating how a nasty pathogen manages to sneak past our immune defences and make us sick. I’m very interested to see what we learn about this system in the future. I think this is an excellent piece of work, the UAB researchers should be proud. Update 2015.09.17 11:21: Initially, I had assumed that all TNT will interact with an IFT before it is exported. I have learned this probably isn’t true and most TNT is exported without ever seeing an IFT. * Technically, NAD+ is a redox shuttle, but that’s a discussion for another time. ** The virulence proteins of pathogens tend to change more rapidly due to the ongoing evolutionary arms race between the pathogen and the host.